EXERCISE: A dreaded word that most of us have a love/hate relationship with. Every year as I anticipate for the Victoria Secret Fashion show to come on, I find myself saying, “UGH! Why can’t I just look like Adriana Lima?? ” Well, FATTY, because you don’t exercise and you eat like sh%#! In my attempt to make myself feel better, and to not have to actually leave my house, I’ve come up with a few ways to incorporate that big, cuddly, comfortable best friend you call your couch without having to move too far from it. Convenient right? Put your (clean) feet on the couch and lower yourself to the floor with your hands getting into a push-up position. 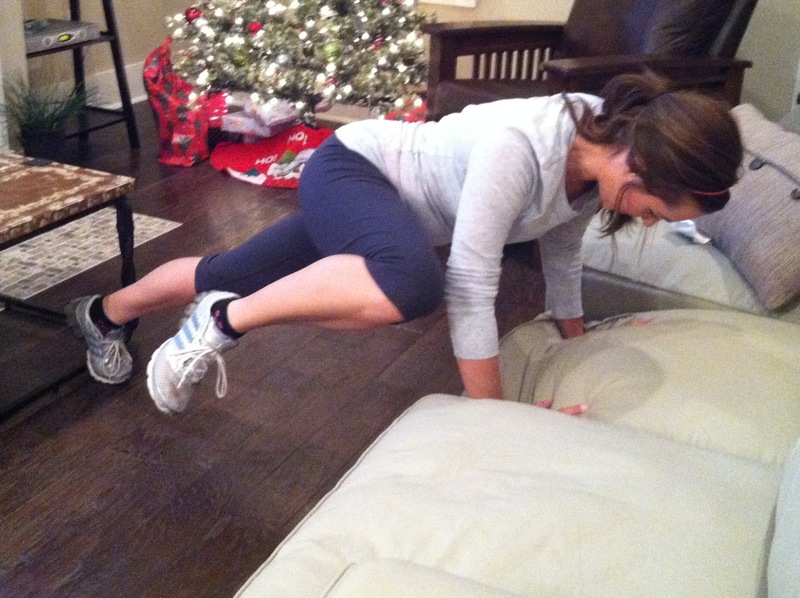 Switch positions and put your hands on the couch and keep feet on floor and push up from the couch for two sets of 10 as well. *You should be breathing very heavily at this point. Do at least one set per commercial. Sitting on the edge of your couch or chair with your arms behind you, bring your legs straight out to make a 90 degree angle with your body. While tightening your abs, use your abs to pull your legs in towards your chest. Push your legs back out to a straight position and repeat. In and out for 20 reps. Do at least one set per commercial. Most of us don’t have medicine balls sitting around our house, so for this exercise, get the same affect of the ball by using a couch pillow. Get on the ground into sit up position and take the pillow and place it between your legs squeezing to keep it in place and crunch up. Do 50 per set. *ADVANCED* Pull your knees up to a 90 degree angle and crunch bringing your elbows to meet your knees and back down. Do at least one set per commercial. Using the edge of your couch or chair, put your hands on the couch and position yourself in a plank position with feet on ground. Take left knee and bring it to your left elbow and squeeze. MAKE SURE your abs are tightened the entire time. Do 15 reps. Same for other side. Take right knee and squeeze up to touch right elbow. Do 15 reps. 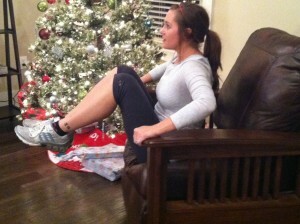 The incline from holding plank position on the couch makes it harder to bring your knees up to elbow. Do at least one set per commercial. No explanation here. During each commercial, try for 100 jumping jacks in between the other exercises. Remember to try and do at least ONE SET of each exercise per commercial. There’s probably 8-10 commercials per show so that is a pretty intense workout for just lounging around the couch, right?! Use this workout regimine for multiple uses such as your weekly favorite shows, movies, or if you are just sitting there bored.